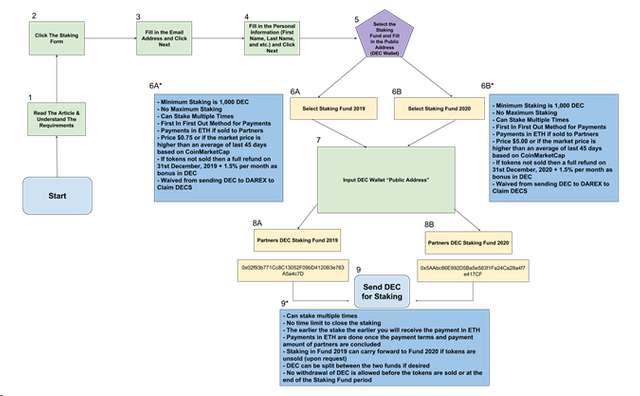 DEC Staking Fund – What it is? Darico Team announced the plan to have the options of stacking the DEC tokens. Participants have the choice to stake their DEC either in Partners Staking Fund 2019 or 2020. Darico is aiming to offer a complete solution regarding tokenization of real world assets and digitization of conventional asset classes by partnering with eligible and qualified parties. For 2019 Darico is targeting to collaborate directly with progressive business leaders, governments and companies, while promoting the latest innovative solutions. Darico will offer a complete solution (A to Z) regarding the tokenization of real businesses and assets. It purpose to cover all aspects of the process from technical, legal, marketing, resources allocation etc. and adapt the action plan according to the scope of business of our different partners. All of these tokens will be listed exclusively on DAREX for primary offering and secondary market trading. According to the team there are already started discussions with potential partners in reaching an agreement on the business scope and applicable terms of cooperation. In exchange for the services offered in these upcoming partnerships, Darico’s compensation will include an operation and management fee and in some deals, depending on the terms, also equity stake. All partners that we’ll sign a deal with in the upcoming two years should stake a considerate amount of DEC for a predefined period, according to the type of business/entity they are dealing with. If that partner is a qualified business, that needs to raise equity or finance debt, staking amount could vary from 50,000 DEC to 100,000 DEC. For other partners such as real estate developers, the amount could go up to 1–2 million DEC staked and for infrastructural or governmental projects even higher than 10 million DEC. The period of staking will vary on the type of partners and it starts from 3–6 months and goes up to 5 years. Taking into consideration that there should be sufficient quantities for OTC deals with the partners, it is introduced the concept of ‘’Partners Staking Funds’’ for DEC. There will be two major funds: Partners Staking Fund 2019 and Partners Staking Fund 2020. • Participants will stake their DEC into the fund. • Upon signing the deal with a potential partner and base on payment terms agreed, participants that contributed in the staking funds will be paid back in ETH. • The payment structure will be based on a FIFO method (First in First out) meaning that the first token holder that staked DEC in the fund, at the time of signing the deal and concluding a payment milestone, will be the first to be paid back. • DEC price for Partners Staking Fund 2019 is set at a minimum of $0.75 or average closing price of the last 45 days in CMC, whichever is higher. • DEC price for Partners Staking Fund 2020 is set at a minimum of $5 or average closing price of the last 45 days in CMC, whichever is higher. • The minimum amount of DEC to be staked from token holders is 1000 DEC. In case there are unsold tokens at maturity of 2019 fund, participants can opt to withdraw their DEC back plus 1.5% interest in DEC per each month that the tokens were staked in the fund or, to transfer it to Partners Staking Fund 2020.